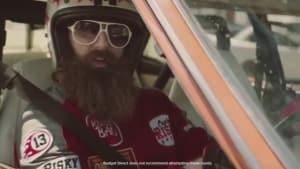 Meet Captain Risky. He's bold, brazen and designs his life around the hunt for adrenalin. But Budget Direct won't insure him. The noble captain is also the new face of Budget Direct – replacing divisive alien couple Zeek and Zia – in the first campaign to come out of its new creative agency 303Lowe since winning the insurer's creative account. Budget Direct director of marketing and digital Jonathan Kerr said theaim of the campaign is to highlight how the company can provide lower premiums because it is choosy about who it will or won't insure. "This is the work that won the pitch," Kerr said. "Budget Direct is well known for its market leading prices but we felt the need to help people understand how we can offer award winning insurance at such great prices." "By saying no to bad drivers, high risk takers and risky circumstances, year after year we are able to offer award winning insurance for less." The campaign will run across cinema, TV, digital, social, print and outdoor with spots highlighting specific Budget Direct offerings including car insurance, home insurance and CANSTAR awards. The campaign was directed by Hamish Rothwell with effects by Alt VFX. Are you loving this campaign? Click on the heart or stink bomb at the top to cast your vote. Click here to see how our featured campaigns are doing - and if you have a campaign to tell us about, drop us an email.